Gather ‘round the table, y’all. This is how we, as a family, make healthy food choices. I have partnered with YMC and Annie’s and have received compensation for this post. All opinions are my own. Fast forward to now, and we’ve entered the overloaded stage of toddlerhood. Joe and I both come from families where food is the centre of all gatherings. We make it a point to emphasize the importance of family meals while making healthy food choices. Since Leo is eating just about everything now, we make it a point to prepare the same meal for the entire family. No exceptions; no separate dishes for anyone. But don’t get me wrong. Meal planning is quite the task. Here are a few of our tips and tricks in keeping mealtime fun, delicious, and how we make healthy food choices as a family. At the beginning of the week (usually, Sundays), Joe and I sit down and plan out our daily meal plan. We break it down to breakfast, lunch, snacks, and dinner. As we jot down our meal ideas, we research recipes and carefully create a list so that we have a plan in place once we hit the grocery store. Meal planning does take time but it ensures that we keep everything homecooked, thus, in control of what we consume as a family. Before we got married, Joe and I were notorious for eating out… All. The. Time. Not only did this burn a hole through our wallets, but it also wasn’t the healthiest of choices we were making. Fast forward to now, we approach restaurant outings as a cause for celebration or a well-deserved treat. We are also very selective with the restaurants in which we dine, ensuring that they’re family-friendly and offer a more refined menu featuring healthier meals. I like to think that I’m one of those people who can whip up a homecooked meal from scratch every single day. Point is: that’s not always the case. Let’s face it, we are a generation of go-getters. I’m a career-driven mom that strives to do the best for her work and her family. Sometimes, time slips away. That’s when I turn to quick-meal solutions for a tasty, warm meal at the end of the day. I know what you’re thinking: huh? What? Pre-packaged food? Healthy choices doesn’t always have to be from farm to table. 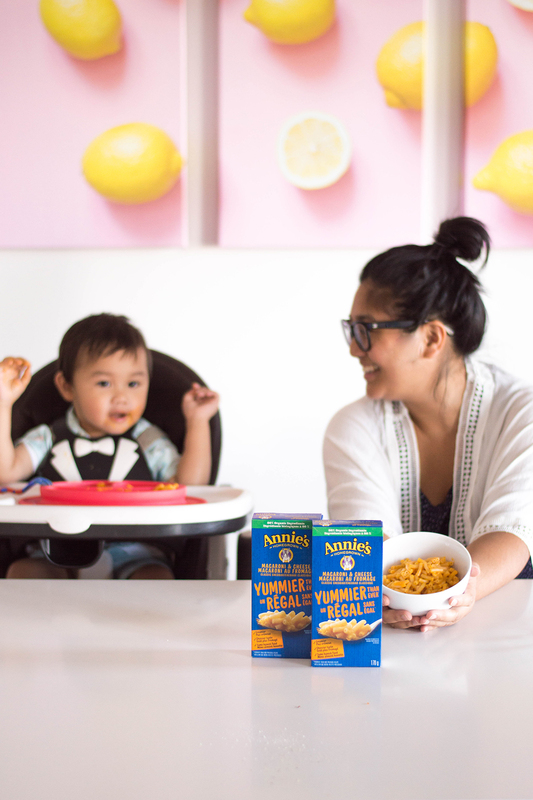 The reality for my family is: sometimes, we need that boxed meal in order to enjoy dinnertime together. Just like how picky we are with restaurants, our family gets choosy in the packaged foods we purchase. In comes: Annie’s. Annie’s concept is simple: provide families with organic food options that are simple to prepare and taste delicious. You may have seen them at your local grocer’s. They have a whole line of pastas, crackers, cookies and fruit snacks. With a diverse product line, Annie’s makes it on our shopping list every single week. 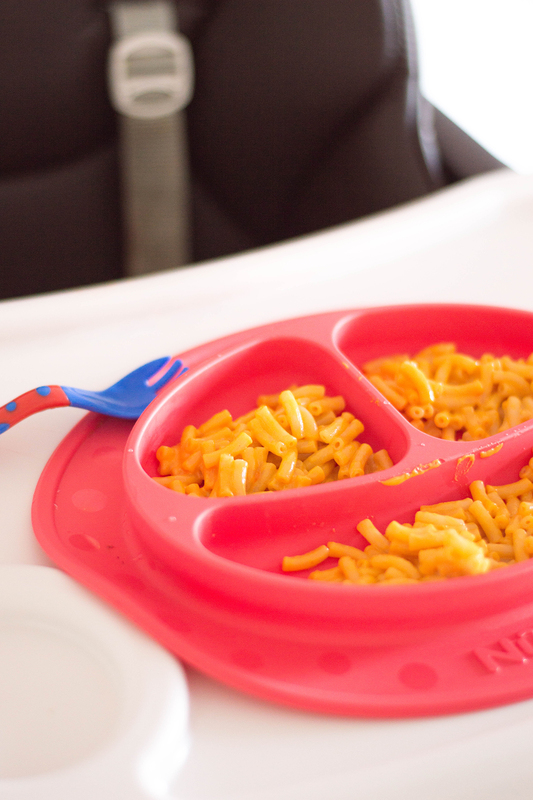 More recently, we discovered their Yummier Than Ever Mac and Cheese. If their product offerings weren’t amazing enough, their new and improved mac and cheese is made with more real cheese flavour, a better sauce, and a better noodle. I know they always say: “Don’t fix it if it ain’t broke.” But you know what? This time around, it wasn’t broken, but Annie’s somehow made it better. Since the noodles are now more kid-friendly in size, Leo is using it to his advantage. Slowly and surely, he’s learning to use cutlery, and Annie’s Yummier Than Ever Mac and Cheese is allowing him to learn and get through this transition. Also: busy mom here. Yup, that’s me! Guess what? I’m tired! There! I’ve admitted defeat. But now, Annie’s Yummier Than Ever Mac and Cheese is a total cooking time of 8 minutes. Yes. Eight. 4+4. That is all. Making healthy food choices doesn’t have to be impossible. 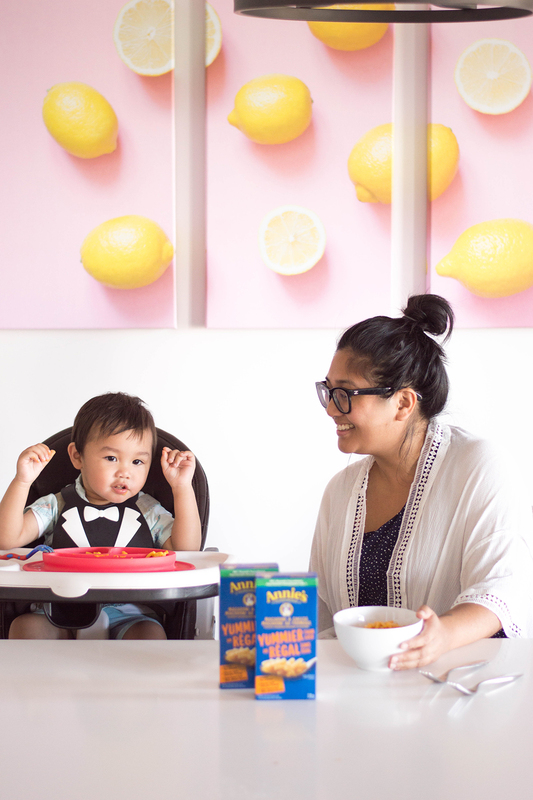 All it takes is some planning, commitment, creativity, and trusted brands to transform mealtime into family time. How do you save time when it comes to meal planning and preparing food? Planning a weekly menu always helps me stay on track. When my husband and I were younger, we ate out a lot. These days, I like the taste of my food so much better and I can control what goes in and stays out of my foods. Every family chooses to be different and that is so true when it comes to food. We grow or raise most of our food and do a lot of canning and dehydrating and putting up. Some families like the convince of box food. Totally up to them. 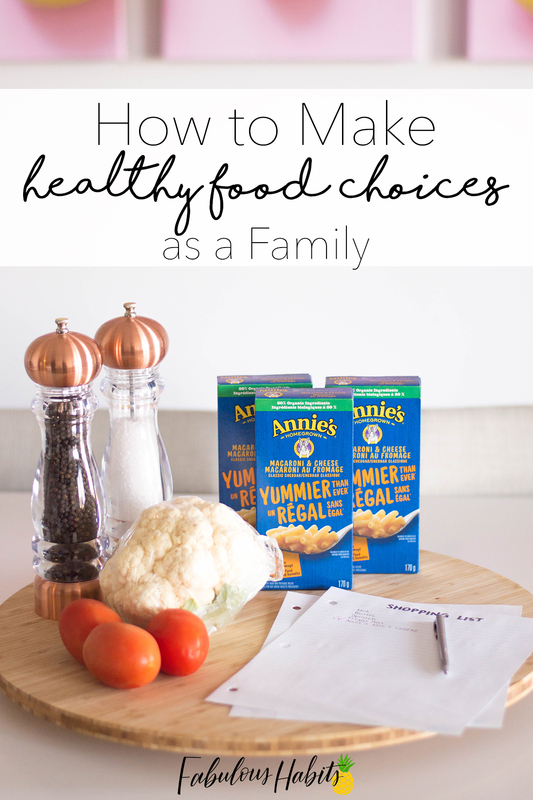 Annie’s makes good products that make it easy to make good choices. I love your photos, what a happy family! Yum, this sounds great for kids! We do try to make healthy choices for the most part, but there will always be cake and cookies in the house. I just try to balance it all. We try to substitute ingredients and items that are healthier when we can. We have used Annie’s items for a while, and my kids seem to like them. My kiddo loves macaroni and cheese. I have not used Annie’s Mac & cheese! I am glad that is a healthy choice because we eat it a lot. My daughters are mac ‘n cheese fiends. I haven’t tried Annie’s brand but it looks delicious and I will look to pick it up next time I’m at the grocery store. I love using Annie’s foods. They are a really great company with awesome ingredients. I love Annie’s food products, they have great snack and food options that my kids love to eat! I like your idea of planning ahead to ensure meals will be healthy. I need to get better at planning meals out for the week better. 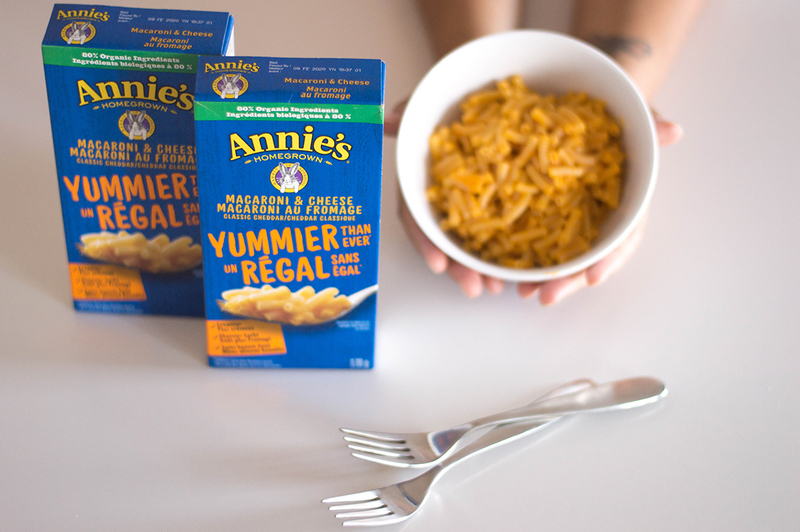 We love us some Annie’s mac and cheese! it is a staple in our house! 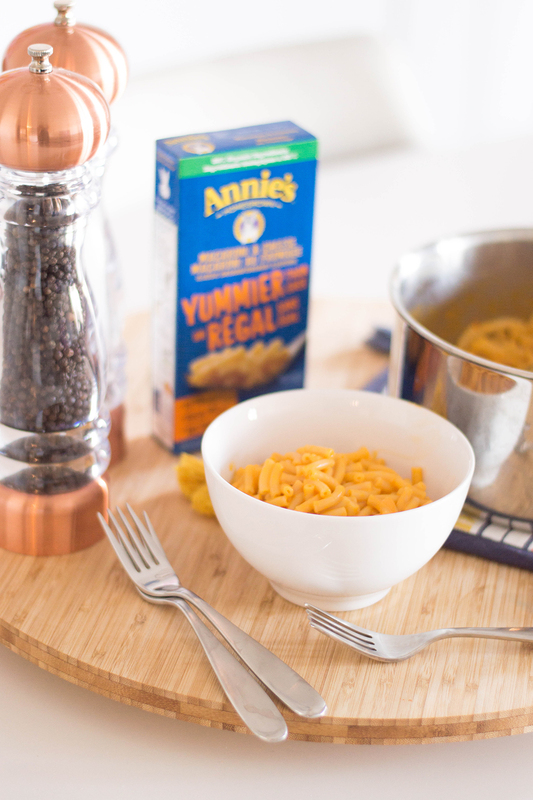 My kids love Annies, and beg for their Mac & Cheese all the time! Also just bought some really yummy looking Annie’s toaster pastries. It’s nice to have foods the kids love. 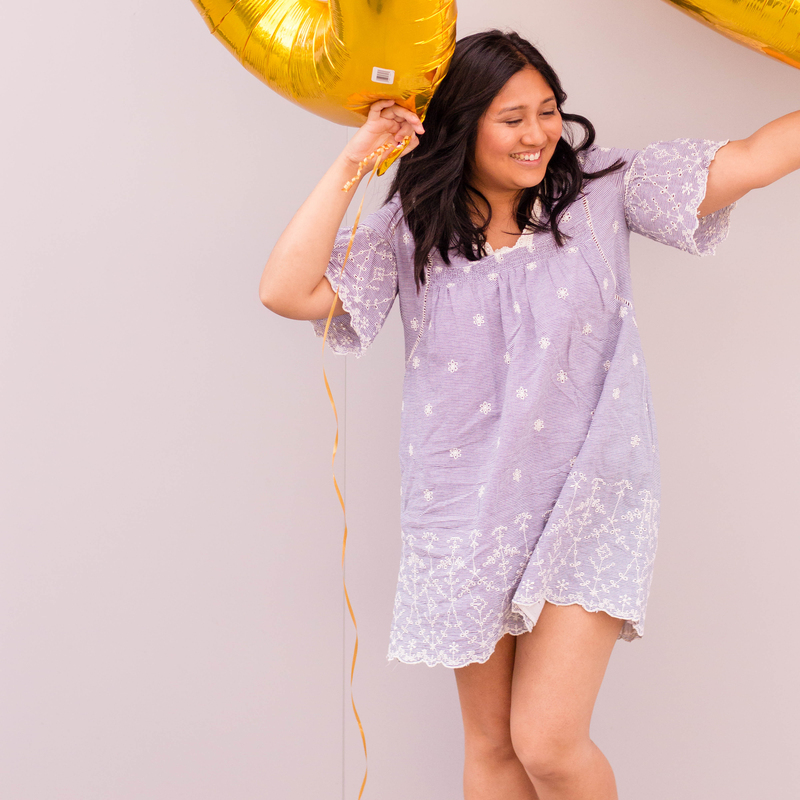 I could have written this post about myself…LOL!! I have been making healthier food choices lately and I feel so much better!! Nice to always have a good choice when it comes to foods. I usually bake some cakes, pizza now I have to balance it all. That is a great idea of healthy food choice! And you are right, cooking at home doesn’t mean that it needs to take a lot of time. We need to find easy and quick ideas for weeknight dinners! We have to plan a weekly menu, so when we go grocery shopping it easier for us to plan a meal around it. If we don’t plan then we can buy things we don’t really need. I love Annie’s, my daughter is obsessed with mac and cheese and my son has sensory issues which results in him being a very picky eater. Annie’s has so many options in their favorite foods that also give me peace of mind about what fueling them. I love stocking my pantry and fridge with healthy foods and snacks. There is nothing better than feeling good about what you feed your children. Menu planing is key for us to stay on track! No doubt sometimes we fall off the wagon, but we always plan for success.